We’re all familiar with the idea of trading in a used car for something new, or at least, something better. The dealer takes your car and puts its value toward a down payment on another car. But, what if you need cash more than you need a car of any kind? You can always sell it to a dealership and walk away with cash. You’re probably thinking, really? I can sell my car to a dealership and walk (not drive) away with cash in hand? Yes, you absolutely can. How Can I Sell My Car for Cash? It’s actually quite simple and often more convenient than trying to sell your car to an individual buyer. Meeting with prospective buyers can be time consuming and frustrating, depending on negotiations and financing. So, a great option is to take your car to McCluskey Chevrolet and offer to sell it to the team there directly. In general, most dealerships will be willing to purchase your car from you, no matter its mileage, or overall wear and tear. But, you should still evaluate your car’s condition before you take it in for a dealership’s consideration. If your car is on the older side or has suffered significant exterior damage or has faulty or non-working parts of any kind, you won’t want to approach a new car dealership. Instead, do some research and determine where you might get the best offer. Many dealerships like McCluskey, which represent major brands, like Chevrolet, have both new and used or certified pre-owned inventories of vehicles. Check automotive authorities, like Kelley Blue Book, which will have the trade-in value of your car already listed and easy for you to access. While this is helpful information for you to keep in mind, it’s likely not going to influence the dealership when it comes to the offer you’re given. The thing is, when you sell your car to a dealership you’re not negotiating its sale price the way you might with a private, individual buyer. Instead, you’ll be offered a price and it will be up to you whether or not you accept it. 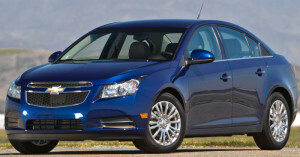 Let’s say you have a 2012 Chevy Cruze. Take it to McCluskey Chevrolet and see what the team there will offer you. The McCluskey Chevrolet team sells new, but is always looking for used cars for its extensive pre-owned Chevy inventory. Stop by and pay them a visit. See how easy it is to sell your car for cash at McCluskey Chevrolet.